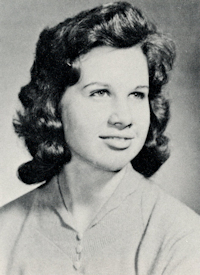 Obituary – Bode, Karen Sue (VanBebber) « Perry High School Alumni Association, Inc.
﻿Band ’58-’61; Student Council ’59-’60; All School Revue ’58-’59; F.T.A. ’60-’61. ﻿Karen Sue Bode, 61, of Orlando died Wednesday, June 29, 2005, in Stillwater Medical Center. Services will be at 2 p.m. Saturday in the Palmer Marler Carberry Chapel, Stillwater. The Rev. Ralph Yost and Vern VanBebber will preside. Interment will follow in the Morris Heights Cemetery, Orlando. Services have been entrusted to Palmer Marler Carberry Funeral Home of Stillwater. She was born July 27, 1943, in Perry, to Ray and Hazel (Winsworth), VanBebber. She received her early education in Perry and was a graduate of the Perry High School class of 1961. She was married to John H. Bode April 22, 1961. They lived in Del City from 1961 until 1967 and then moved east of Orlando to a farm that they had since resided on. She was a member of the First Baptist Church of Perry and also taught Sunday school for over 20 years. She was a member of the Stillwater Art Guild, Oklahoma Mineral and Gem Society and enjoyed stained glass work. She taught many people the art of stained glass making. She was also involved three years with the Stillwater summer enrichment program for kids. She and her husband held demonstrations at several area schools on rock polishing. Preceding her in death were her parents and one sister, Ramona. Survivors include her husband of the home; one son, John R. Bode of Perry; two daughters, Lori D. Bode and husband, Ron Lomenick, of Perry and Jonene L. Cook and husband, Jeremy, of Stillwater; one sister, Wynona Passow of Perry; 10 grandchildren and two, great-grandchildren. Serving as pallbearers will be John R. Bode, Leon Riggs and Jesse Blocker. The family asks that in lieu of flowers, donations be made to the Oklahoma Lions’ Boys’ Ranch or to C.A.S.A.